Select the printer agent(s) in the left pane that you wish to migrate from eDirectory. Select the destination Windows print server in the center pane. Select the Printer Installer folder you would like the printer to be published to in the right pane. 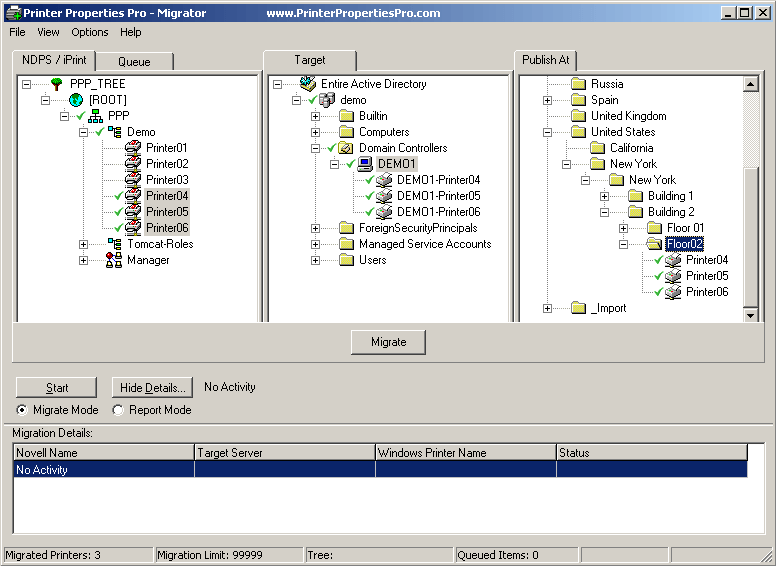 Click the migrate button below the selection panes to add the printers to the migration queue. Click yes if prompted to start the migration queue, or manually start the queue by clicking the start button above and to the left of the queue window. After you have completed the printer migration steps above simply select (from within the Printer Installer Administrator), Tools > Settings > Printer Conversions, and then enable the Enable Printer Installer Client to convert end user's Novell printers to TCP/IP printers option. When an end user logs into a computer that has the Printer Installer Client installed, any Novell printer that was migrated by the Printer Installer Migrator, that exists on the end user's computer, will be converted from a NDPS / iPrint printer to the new Windows shared printer. Note: you can also simply click on the clients system tray refresh option to activate the printer conversions. Use this option if you want to specify the 64-bit and the optional 32-bit driver to use for each printer instead of allowing the software to automatically find the same driver on the target server. You will be shown the driver model name that is currently associated to the printer in eDirectory and be allowed to specify an inf file or driver from the target server to use to create the printer on the target server. Use this option to allow the software to automatically find a driver on the target server with the same driver model name as the current driver being used in eDirectory. Specify if you want the software to use HP universal drivers when creating the printer on the target print server. Whenever a printer with an HP driver is created on the target server, the software will use the HP Universal Driver that corresponds to the type of driver specific model being used in eDirectory (PCL, PCL5, PS). Whenever a printer with an HP driver is migrated from Novell the HP universal drivers will be used to create the printer on the target 64bit print server . Whenever a printer with an HP driver is copied from Novell, the HP universal driver will be used to create the printer on the target 64bit print server only if a driver with the same model name can't be found on the target print server. Use this option to specify the type of HP universal driver to use during the migration. PI Migrator will attempt to read the type of HP driver being used for the printer in Novell and match it with the same type of HP universal driver. For example if the driver being used in eDirectory is an HP Laserjet 4250 PCL6 then Printer Installer Migrator will use the HP Universal PCL 6 driver when creating the printer on the target print server. If the driver type (PS, PCL5, PCL6) cannot be identified it will use the specified driver type. PI Migrator will attempt to read the type of HP driver being used for the printer in Novell and match it with the same type of HP universal driver. For example if the driver being used in eDirectory is an HP Laserjet 4250 PCL6 then Printer Installer Migrator will use the HP Universal PCL 6 driver when creating the printer on the target print server. If the driver type (PS, PCL5, PCL6) cannot be identified it will indicate an error on the printer item in the migration queue. PI Migrator will use the specified type of HP universal driver for all printers being migrated that use HP drivers. For example, if you migrate a printer using a HP 4250 PCL6 driver and you have specied this option with PS, then the printer would be created on the target print server with the HP Universal PS driver. When installing the universal driver on a 64bit print server, automatically install the 32bit universal version as well. If Printer Installer Migrator creates a printer on the target print server using the above rules it will also install the 32bit HP Universal for the printer. When printers are being created on the target print server the newest driver (XP else 2000) will be associated to the new printer. Printer Installer Migrator will attempt to read the type of HP driver being used for the printer in Novell and match it with the same type of HP universal driver. For example if the driver being used in eDirectory is an HP Laserjet 4250 PCL6 then Printer Installer Migrator will use the HP Universal PCL 6 driver when creating the printer on the target print server. If the driver type (PS, PCL5, PCL6) cannot be identified it will use the specified driver type. Printer Installer Migrator will attempt to read the type of HP driver being used for the printer in Novell and match it with the same type of HP universal driver. For example if the driver being used in eDirectory is an HP Laserjet 4250 PCL6 then Printer Installer Migrator will use the HP Universal PCL 6 driver when creating the printer on the target print server. If the driver type (PS, PCL5, PCL6) cannot be identified it will indicate an error on the printer item in the migration queue. Printer Installer Migrator will use the specified type of HP universal driver for all printers being migrated that use HP drivers. For example, if you migrate a printer using a HP 4250 PCL6 driver and you have specied this option with PS, then the printer would be created on the target print server with the HP Universal PS driver. If a driver exists on the Windows print server regardless of the version, never replace it with a driver from Novell. For example if there is an existing printer on the Windows print server with the same name as a printer being migrated, Printer Installer Migrator will show a dialog box for you to specify a new printer name. If this option were disabled the dialog box would not be presented and the printer would be shown in the migration queue with an error instead of halting the migrations of the remaining printers. Enabling this option will cause Novell printers setup as LPR printers to be created as as RAW TCP/IP on the Windows print server. Enabling this option will enable the SNMP option when creating the printer on the Windows print server. Before the printer is migrated a ping will be sent to the DNS name or IP address of the printer, if the ping fails the printer will be listed in the migration queue with an error indicating the ping failed. To successfully migrate a printer the printer must be installed on the computer running Printer Installer Migrator. Printer preferences and device settings will be copied from the printer and applied to the printer being created on the Windows print server. Note: If you are migrating to a 64bit print server the settings will only be applied if the driver being used in eDirectory is a universal print driver. Enabling this option causes Printer Installer Migrator to do a nslookup on the printers IP address and will then use the full DNS name for the port value when creating the printer. If a NDPS/iPrint printer has a DNS name in the port value, it will use the value. Same as the above option but it will only use the short DNS value. For example, if Printer Installer Migrator does an nslookup on 1.1.1.1 and it returns printer1.domain.com, only "printer1" will be used for the port value when creating the printer. Using the Stop/Start button in the lower left, you can stop and start the migrator queue at any time. After a printer has been migrated, you can right-click the new printer in the right pane and unmigrate it. The printer will be deleted from Active Directory and will not be migrated on any further end-user workstations. Green Check - Successfully migrated printer. Green Circle - Printer currently being migrated. Grey Circle - Printer queued for migration. Red Circle with Exclamation - Printer failed to migrate. Hover over printer or see printer queue for details.